It is always a pleasure and a privilege to welcome a debutant collaborative pairing to Proton Music. The "Superposition" EP from two outstanding Australian artists is no exception and it is thus with great excitement that we welcome Matter and GMJ to our talented roster. A regular in the clubs of his Melbourne hometown, self-taught musician, Matty Doyle, has built up a growing head of steam under his Matter production soubriquet since early production work for Underphunk Recordings. A producer much in-demand, his elegant production style has won Australian plaudits and fans in equal measures. Taking his audio cues from the hotbed of talent that saw Luke Chable and Kasey Taylor rise to prominence in the heyday of progressive house in the early 2000s, Matter's style and panache behind the decks and in the studio has seen a blossoming talent. Work for Balkan Connection, Stellar Fountain and Clinique has overseen an ever-expanding portfolio, as have a pair of remixes for Proton Music in the shape of Biologik's "Freon" and Dousk's iconic "Look Good Tonight". Gavin Griffin is another Australian talent causing quite a stir over the past eighteen months after building a strong reputation under his GMJ production moniker. Initial work for Vapour Recordings in 2010 that included remixes from Dousk and Jamie Stevens thus saw GMJ in the underground dance limelight. A long-time DJ with over two decades of experience, the GMJ production sound has seen a penchant for "deep rhythms and spatial textures" transformed into a raft of successful original and remix production work for Balkan Connection, Clinique and Particles. Indeed, it is with the latter that almost a quarter century of production credits led to the successful "Edge of Remembrance" and "Forgotten Wisdom" EPs with high-profile remixes from the likes of East Café, Stephen J. Kroos and Rick Pier O'Neil. 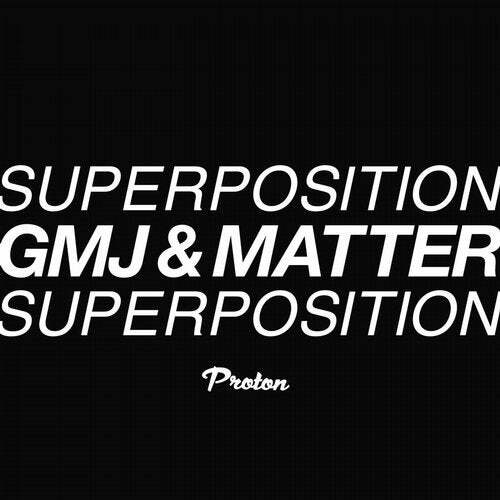 Joining forces for the first time, Proton Music is thus proud to release the much anticipated collaboration between Matter and GMJ in the shape of the "Superposition" EP. "Atoms" opens proceedings with a rich and sumptuous bass line that ties itself seamlessly to a dynamic percussive groove and strong beat. Elegant melodic flow oozes from every pore as textured pads and delicate riffs vie for attention as they cascade off each other. Evolving fluidly throughout, "Atoms" is a mature and exacting work. Partner track "Space Between" continues the rich, deep production values of its predecessor as intricate, cadenced rhythms and bouncing bass groove provide a perfect vehicle for trademark sequenced melodies to emerge from the aural melange. Developing effortlessly over a near nine-minute outing and rising to an emotive zenith in the third movement, "Space Between" is a superlative piece. As the working "Space Between" Matter and GMJ exudes production excellence, the "Superposition" EP is sure to be the nucleus of a hugely productive relationship.